Duke’s Din-Din recipe is an excellent source of high quality protein for puppies and dogs. This grain-free dinner consists of wholesome vegetables and fruits like carrots, green peas and apples. This recipe also includes nutrient-rich sweet potatoes as an exceptional source of vitamins, minerals and beta-carotene, which help maintain your dog’s immune system. Fish Broth, Fish, Dried Egg Product, Tapioca, Salt, Duck, Sweet Potatoes, Carrots, Pumpkins, Sunflower Oil, Pea Protein, Green Peas, Apples, Natural Flavors, Guar Gum, Potassium Chloride, Calcium Sulfate, Choline Chloride, Vitamin E Supplement, Ferrous Sulfate, Zinc Oxide, Vitamin B12 Supplement, Copper Proteinate, Vitamin A Supplement, Manganese Proteinate, Niacin, Calcium Pantothenate, Thiamine Mononitrate, Sodium Selenite, Biotin, Riboflavin Supplement, Pyridoxine Hydrochloride, Potassium Iodide, Vitamin D3 Supplement, Beta-Carotene, Folic Acid. Feed Adult dogs 1 8 oz. container per 8 - 10 lbs of body weight daily depending on activity level. Food consumption varies during gestation. Feed the amount needed to maintain the pregnant female’s ideal condition. Food intake may double or triple during lactation. 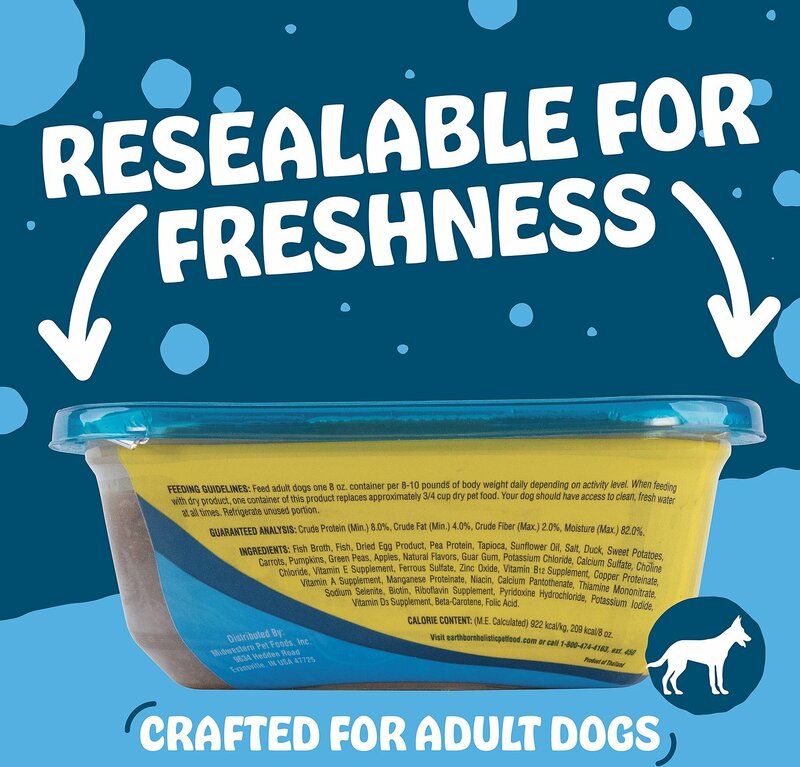 When feeding with dry product: 1 container of this product replaces approximately 3/4 cup dry pet food. Your dog should have access to clean, fresh water at all times. I researched moist food to find one that was phosphate free when I found Earthborn on Chewy. I was familiar with this brand and was very happy that it was not only from the USA but "locally made". I was very mistaken!!! This formula as well as the Lamb are made in THAILAND and DISTRIBUTED in the US. Big difference. This is my number one rule when looking for food or treats for my dogs!! I'm very disappointed and I wish this would've been obvious to me in the description. Now I've got 2 cases of it. I've only used 1 container and then I saw it. Small as can be of course on the label!! My dogs love it of course but I don't want to feed it to them now!! Just wish it came in a variety pack so I didn’t have to buy 2 or 3 cases of different flavors. No they hated this one, and it is mostly runny gravy, with very little substance. Looks bad and smells bad to me. Not a good one at all. Food is expensive for the amount but my dog loves it. 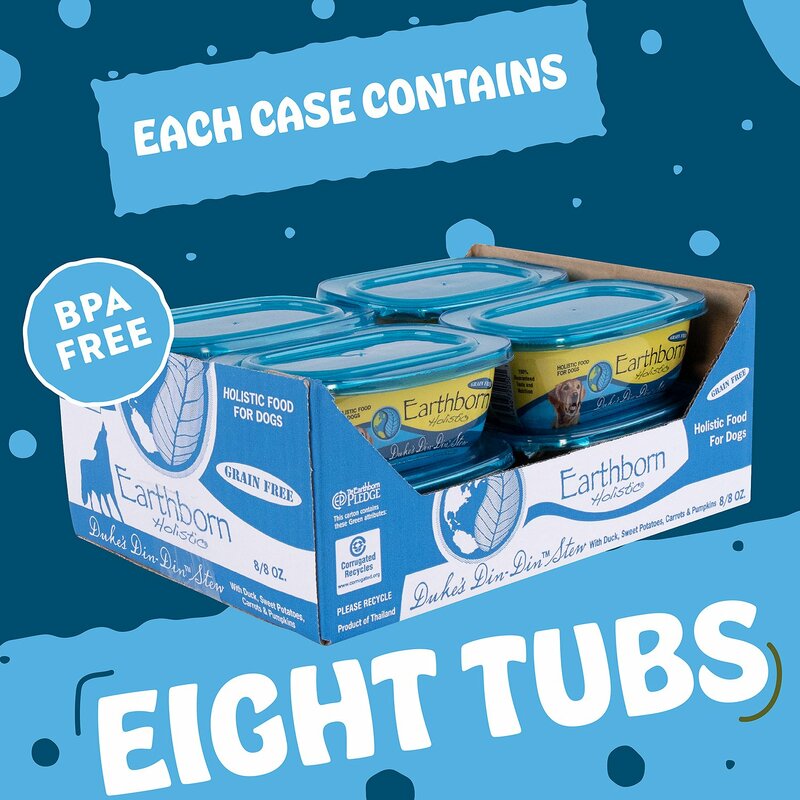 My dogs have been eating both Earthborn dry & moist dog foods for a while now and they still love it. Mornings is dry only, but the evening feed is a little dry topped with a generous scoop of the moist. And their coats have never looked better. Highly recommend this brand. This wet food is awesome because it looks like people stew. It mixes very well with the dry food. It is a little extra fun for pups. We get this wet food on auto delivery and switch up our kind each time. They love a scoop with their kibble! Loved it and can't wait to eat it! My dogs love this addition to the dry food. My only complaint is the foil seal is extremely hard to remove! I use a knife to cut around it as I can't pull it off.